Carte Générale de l'Ile de St. Domingue. 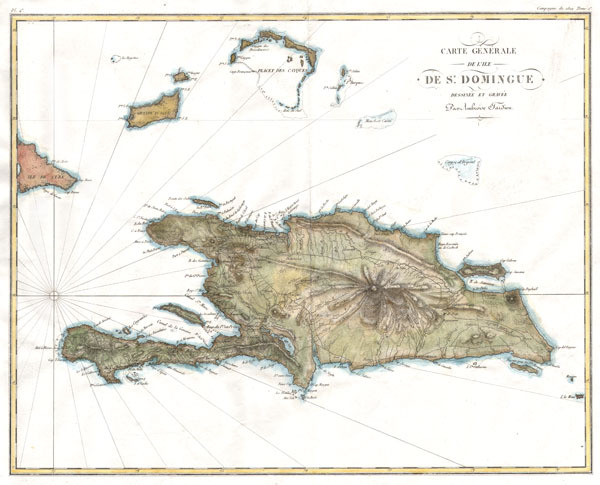 A rare and beautiful 1802 map of the West Indies island of Hispaniola or Santo Domingo ( St. Domingue ) by Ambroise Tardieu. This rare and stunning map depicts the island with all of Tardieu's glorious hallmark detail. Roads, topography, cities, and occasional depth soundings are rendered with meticulous care. Map includes the island itself as well as parts of Cuba and Les Caicos ( Cayques ). This map was originally prepared for inclusion in atlas volume of General Comte Mathieu Dumas's 8 volume Precis Des Evenemens Militaires, a history of French military campaigns during the Napoleonic era. Very Good condition. Original centerfold. Minor printing error at upper right margin – see photo. Original plate-mark visible. Else clean and beautiful.